We're excited for Syfy's "Game of Thrones in space" series The Expanse, based James S. A. Corey's series of books (which begin with Leviathan Wakes). 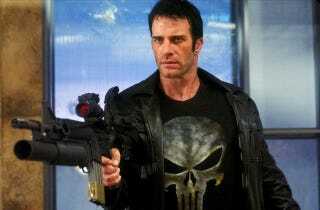 And now the show has cast one of its leading men, Hung, The Mist, and The Punisher actor Thomas Jane. THR reports that Jane will be playing Joe Miller, a native of the asteroid belt. In Leviathan Wakes' 23rd century, Miller serves as a detective aboard Ceres station when he is tasked with finding a missing young woman. His increasingly obsessive quest to find her will bring him in contact with a rogue ice mining ship and a deadly conspiracy with grave consequences for the future of humanity. THR describes Miller as. "Ragged, in search of something even he can't identify, Miller remains a dedicated cop with great instincts who discovers a newfound sense of purpose when he's put in charge of the investigation into a missing heiress." Now that we have our Miller, we'll have to wait and see who gets cast as Jim Holden and his crew.